Just planted a new tree? It may be small now, but with a basic understanding of tree biology, you can help it grow to its full potential. 1.Stake the tree, only if necessary. Studies show trees establish more quickly and develop stronger trunk and root systems if they are not staked at the time of planting. Staking may be required when planting bare root stock or planting on windy sites. Materials should be flexible and padded to minimize injury to the trunk, yet still allow movement. It is important to remove support staking and ties after the first year of growth. 2.Mulch the base of the tree. Mulches spread around the base of a tree, holds moisture, moderates soil temperature extremes, and reduces grass and weed competition. The two major types of mulch are organic and inorganic. 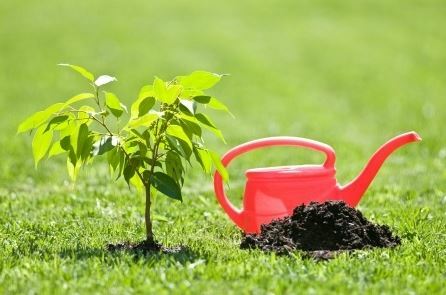 Inorganic mulches include various types of stone, lava rock, pulverized rubber, geotextile fabrics, and other materials. Inorganic mulches do not decompose and do not need to be replenished often. On the other hand, they do not improve soil structure, add organic materials, or provide nutrients. A 2- to 4-inch (5- to 10-cm) layer is ideal. More than 4 inches (10 cm) may cause a problem with oxygen and moisture levels. Piling mulch right up against the trunk of a tree may cause decay of the living bark. At the time of planting, limit pruning to dead or broken branches. All other pruning should be withheld until the second or third year, when a tree has recovered from the stress of transplanting. You should always have a distinct purpose in mind before making any pruning cut; every cut has the potential to change the growth of the tree. Note: This post shares content from http://www.treesaregood.org. Please visit the site for more excellent tree care information!